The looks may be classic, but many craftsmen in Maine are giving their Down East builds something extra nowadays, whether working in wood or fiberglass. Farrins Boatshop in Walpole, for instance, has done everything from installing a lockable wheelchair space at the helm to building a doggie door on board. John’s Bay Boat Company in South Bristol designs ergonomic helm seats with curved backs to avoid wasting the valuable inches that cushions take up in tight spaces. Sabre Yachts in South Casco installs Volvo Penta IPS pod-drive propulsion, saving engine room square footage while giving skippers joystick control. Wilbur Yachts in Southwest Harbor recently built a custom base for a green stick, used in tuna fishing. These are not your granddaddy’s Down East boats. 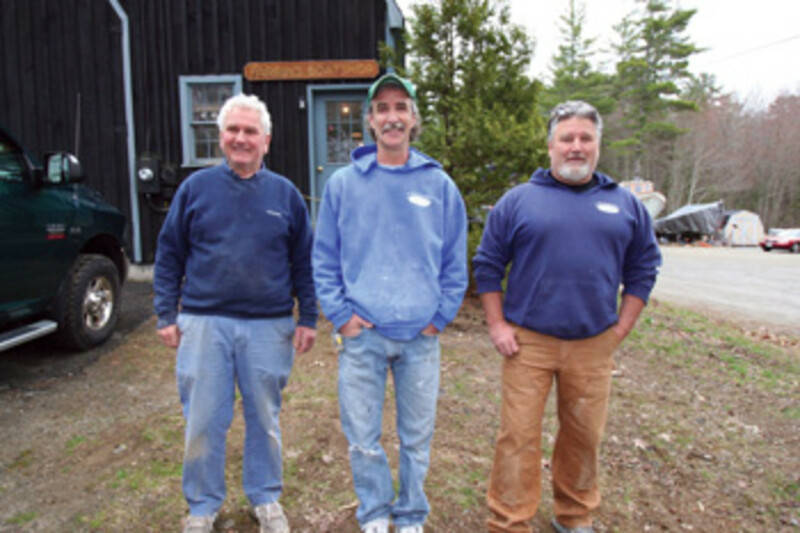 He and his brother, Seth Gray, own Newman & Gray Boatyard on Great Cranberry Island off midcoast Maine. Their team spent the winter finishing this boat, a new model called the Williams 38. 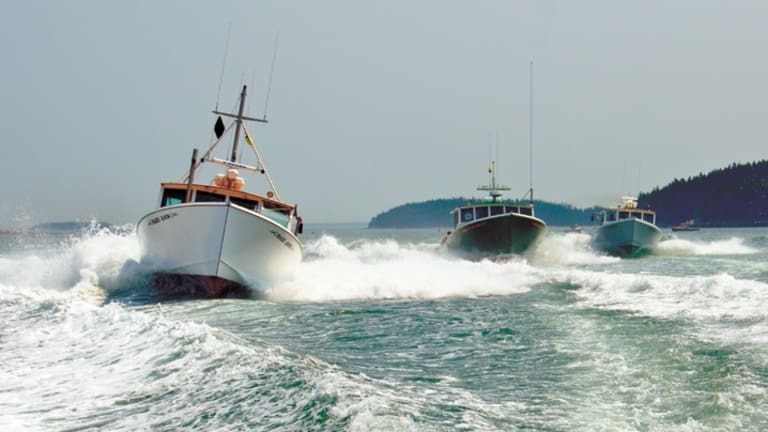 She’s an example of the kind of boats that made Maine famous — that classic Down East style — but she also shows how much these boats have evolved. 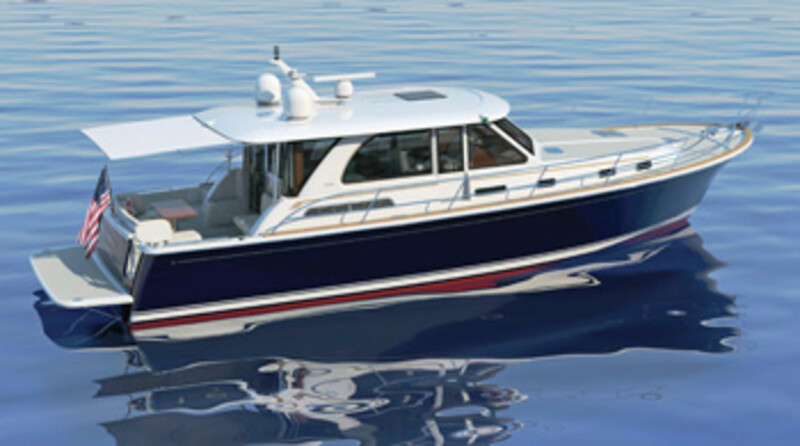 When her modern planing hull hits 40 knots, you realize that this is no ordinary lobster cruiser. 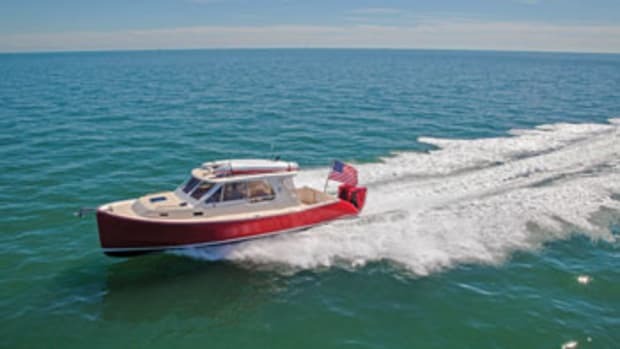 Doug Zurn of Zurn Yacht Design in Marblehead, Massachusetts, modified the lines of the Stanley 38, designed by Lyford Stanley and built for years by John Williams Boat Company, of Quarry Hall, Maine. 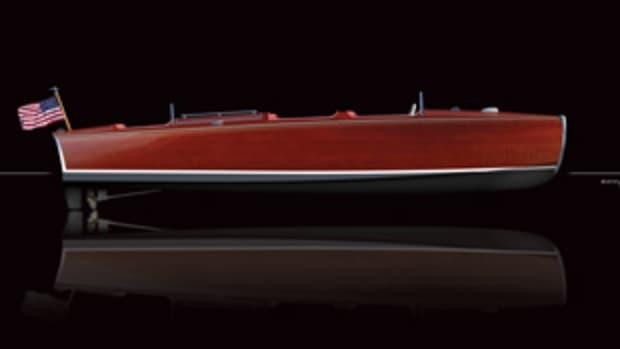 Zurn drew a modern planing underbody with the classic style of a lobster yacht above the waterline. Williams built the boat’s hull and structure with e-glass and Core-Cell and installed twin Volvo Penta IPS600 diesel pod drives. Rubber mounts under the engines reduce hull vibration, and a Zipwake dynamic trim-control system eases pitch and roll. 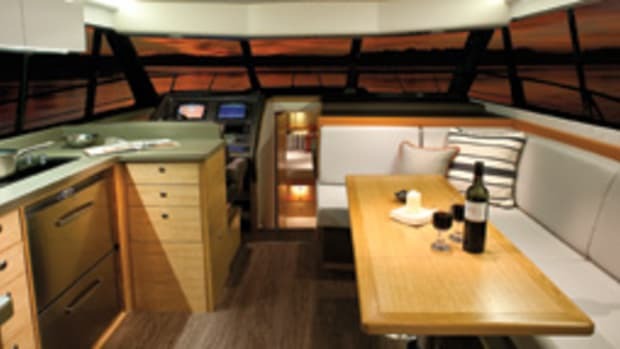 Teakdecking Systems provided modular decks and soles, and the engine hatch tilts from flat to vertical on an electric actuator with the touch of a button. At the helm — just as on a luxury car — the boat wakes up with the flash of a “key” in front of a chip reader. She rides as smooth as silk. “Hold on, I’ll turn,” Josh Gray says, banking at high speed. A shiver of delight runs up my spine. 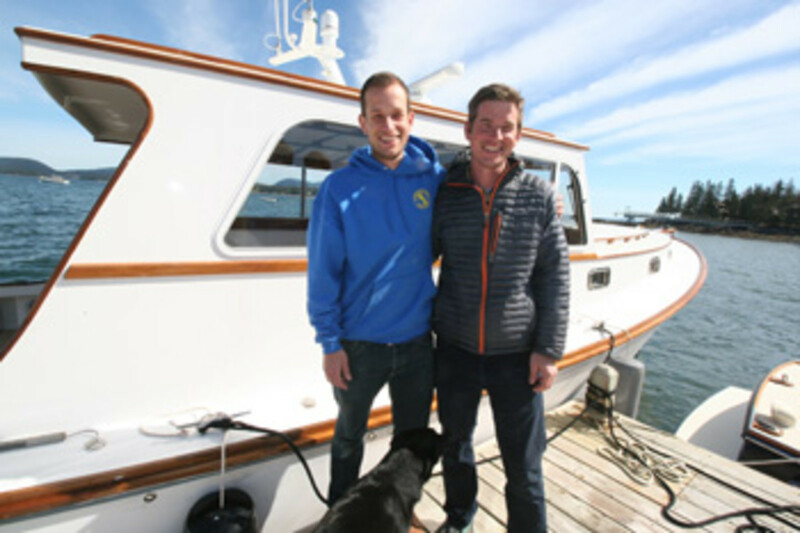 Standing at the Great Cranberry dock in sight of classic wooden boats built by Bunker & Ellis and Ralph and Richard Stanley, the Gray brothers considered what working on Moonshot has meant to them. 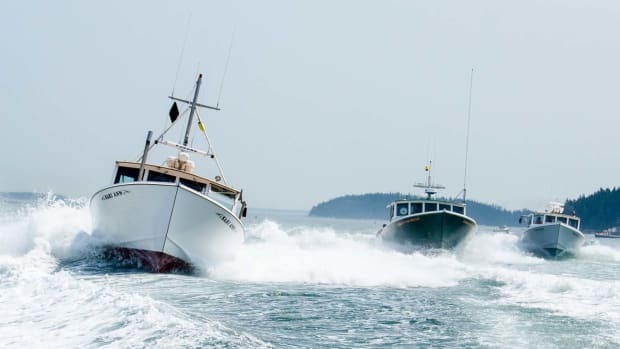 Farrin’s Boatshop calls itself a custom finisher of classic hulls, which means its craftsmen use their creativity differently than the team at Newman & Gray does. 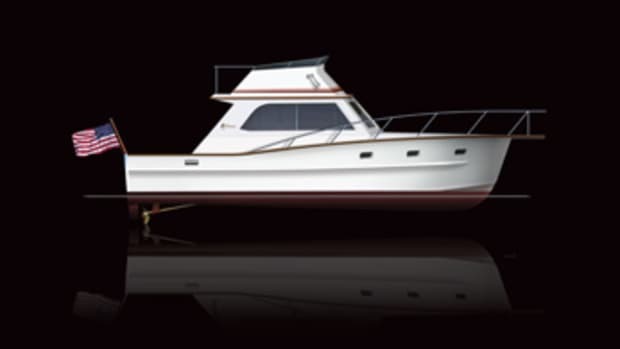 At Farrin’s, the goal is to fill any basic hull with whatever the owner can imagine, want or need for the interior. As a reminder of that mission, Kelly Anne, a 34-foot Calvin Beal sportfisherman finished a few years ago, is memorialized with her name painted on the shipyard’s wall. Farrin’s finished the boat for a man who was paralyzed from the chest down in a car accident. 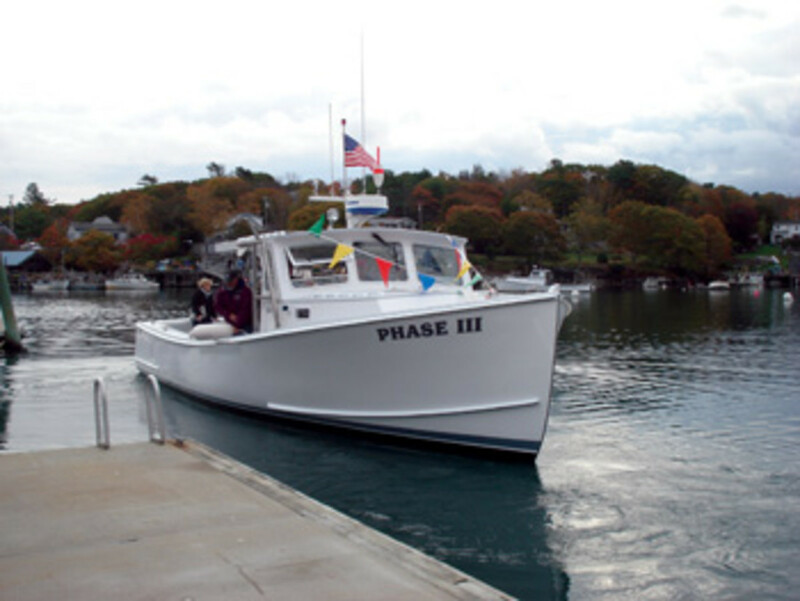 The crew made the boat usable for the owner, with features that include a transom door combined with an extendable aluminum ramp, and a place at the helm to lock in a wheelchair. Kelly Anne is one of two boats Farrin’s has finished for people with such physical needs. The level of specialization is practically the yard’s calling card. At the moment, Farrin’s has a 43-foot Carroll Lowell yacht and a 42-foot Calvin Beal sportfisherman under construction. The designers are known for their Down East boats. Construction of the 43’s hull and superstructure are by Lowell Brothers in Yarmouth; SW Boatworks in Lamoine molded the Beal. 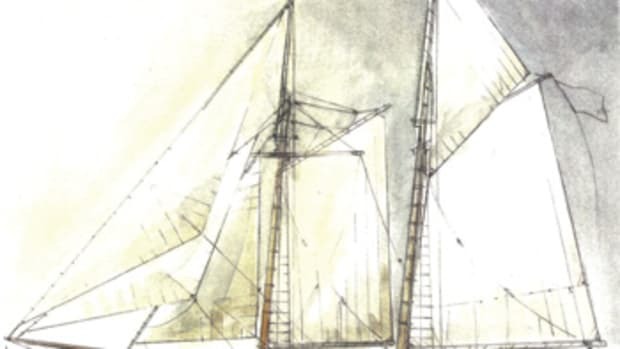 Before opening his own shop, Bruce Farrin got his start at nearby Harvey Gamage Shipyard, helping to build the 125-foot Antarctic research vessel Hero and the 125-foot schooner Shenandoah, among other vessels. He then began doing fiberglass construction, learning by doing and consulting with other builders as he went. In the beginning, he mostly built commercial lobster boats. Today, his family-run yard mostly builds pleasure boats, though commercial boats remain an important part of the business. Counting everything down to 8-footers, the yard has produced more than 200 boats. The all-composite 42-foot Calvin Beal is a lot different from the big wooden boats he started out building. It has a lot of custom features, including a tuna door with a ramp to water level, a 30-foot green stick and an outside helm. John’s Bay Boat Company owner Peter Kass doesn’t make it easy to find his yard. He began building on the shorefront in 1983, after working at other yards, including Harvey Gamage. Drive down a long peninsula road to a narrow lane with a bunch of dirt offshoots and no sign. Take a lucky guess on which dirt road is the correct one, and you’ll find the shop, marine railway and a pile of lumber, with the bay beyond. “It keeps out the riffraff,” Kass jokes as he clambers up from the muddy deck of the workboat Jamie-K, which his crew built 27 years ago and is seeing again to repair an engine problem. Kass is one of the last adherents (among commercial builders, anyway) to traditional plank-on-frame boatbuilding. But that doesn’t mean he’s an old fogy. Wearing greasy jeans, sneakers and a John’s Bay sweatshirt, he’s known for meticulous work, a high-caliber crew, integrity in design and construction, and gorgeous carpentry. 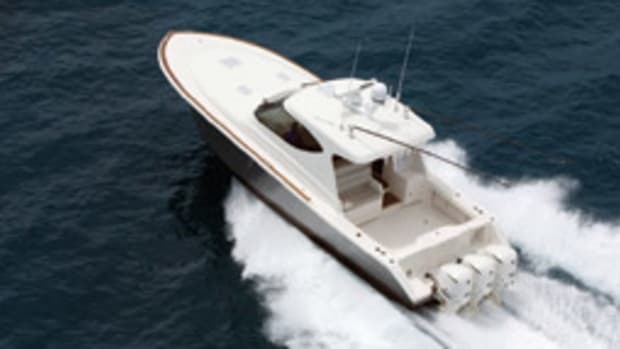 Customers range from high-lining fishermen to high-end yachtsmen. 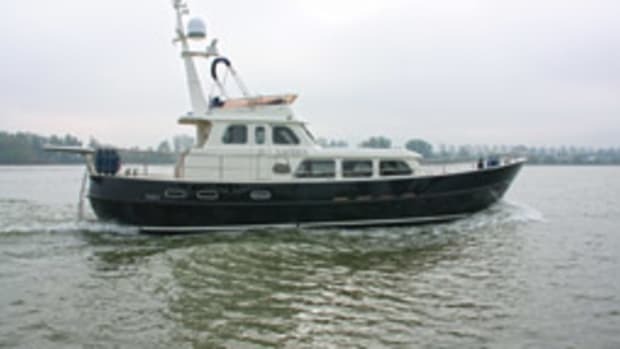 A 42-foot Down East cruiser named Rhum was recently launched. She has a wooden deck, trim and furnishings; bronze and brass hardware and light fixtures; a double door to the wheelhouse; and custom windows. For strength, the transom was built with five layers of cold-molded wood, then cut in half and refined to create a gate from the cockpit to the swim platform. At the helm, the captain and mate’s bench seats have curved backs designed to be comfortable without cushions. Raised paneling and curved corners complete the cabinetry, and dark and light woods alternate in the trim. The old-fashioned feeling continues with Sipo beams, wood joinery throughout the master stateroom and around doors and windows, a paneled door enclosing the refrigerator and granite countertops. You can practically smell the sea salt. In the next bay over, the crew is building the 47-foot workboat Sailor’s Way for a Stonington fisherman. He’s a third-time customer, each boat bigger than the previous. This one fills the shop end to end. Given the level of detail in his work, Kass might best be described as a perfectionist who keeps the bar high for longtime Maine standards while still evolving with his fellow builders, to add something original in each Down East package.